For an On-page Surveys, the survey questions can be added from the Add Questions screen. The survey preview generated on the screen changes in accordance with the question you select. You can move a question block to reorder the sequence of questions. Use the (+) icon at the top right of a question block to duplicate that question block. (Optional) Enter a Welcome Message for the survey. The welcome message is displayed only if you have added the message. If you have not added any welcome message, visitors will right away see the survey questions. 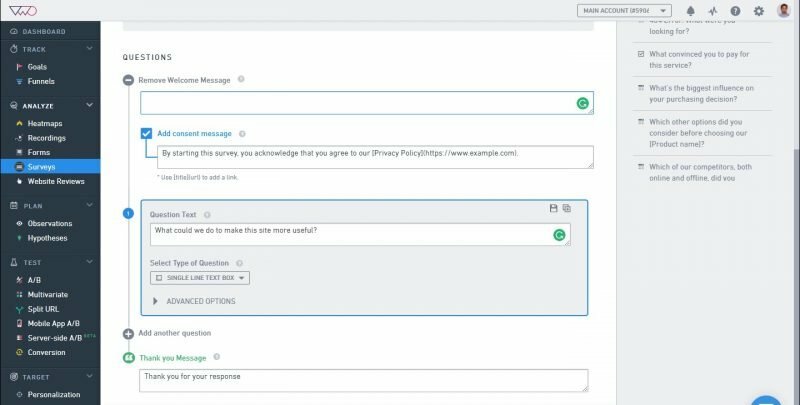 ATTENTION If a user clicks on the consent message, but does not start the survey, VWO will count the event as Displayed and Attempted. 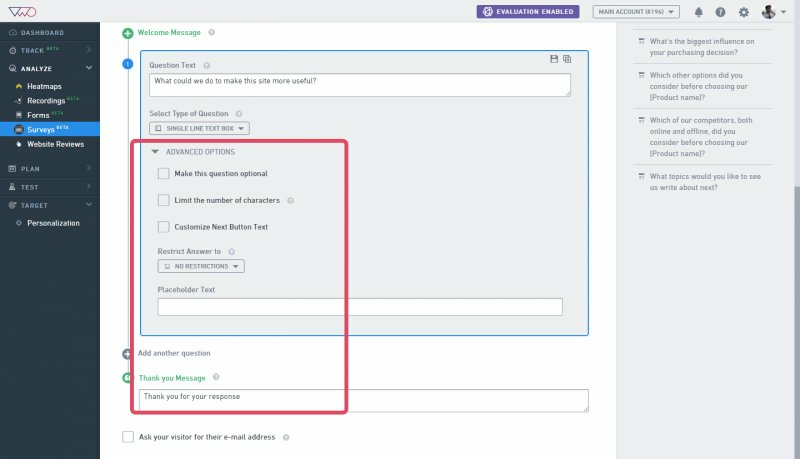 In the Question Text field, type the question you want to ask your visitors. To select one of the following question formats, click the Select Type of Question drop-down arrow. Single Line Text Box: Select this question type if you want to display a single-line text box for the responses you want to collect. Multi Line Text Box: Select this type if you want to display a multiple-line text box for entering a visitor response. Radio Button: Select this option if you want to help visitors choose one option from many to indicate their responses. Checkbox: Select this option to display check boxes for survey responses. Dropdown: Select this option to allow visitors to select an appropriate response using a drop-down list. Multi Select List: Select this option if you want to display a list of responses that visitors can select from. Rating (5 stars): Select this option if your survey needs to collect only ratings as feedback from the visitors. Net Promoter Score*: Select this option to ask if your visitors would like to recommend the product or website to their contacts. If you select NPS option, you can customize the score labels under ADVANCED SETTINGS. For example you can change the default least score label ‘Not at all likely’ to ‘Never’ or the highest score label ‘Extremely Likely’ to ‘Absolutely’ and so on. Select Make this question optional if you want to make the survey question optional. By default, all questions are mandatory. Your visitors can skip to the next one if a question is marked optional. Select Limit the number of characters option to determine how long or short an answer can be to be accepted as a response. Select Customize Next Button Text to have the text that you want. Use the Restrict Answer to drop-down list to select the input format you want in the response. You can choose to receive responses in different formats such as number, phone number, email address, date, URL, and regular expressions (regex). This option is available only for the Single Line Text Box question type. No Restrictions: Enter letters, numbers, or special characters in their responses. Enter placeholder text for input boxes in the survey. The placeholder text serves as a guide or tip for your visitors. This option is available only for Single Line Text Box and Multi Line Text Box type of questions. For example, you may want to add instructions like “Enter a date range” in the input text box. PRO-TIP The advanced options are displayed per the question type you choose. 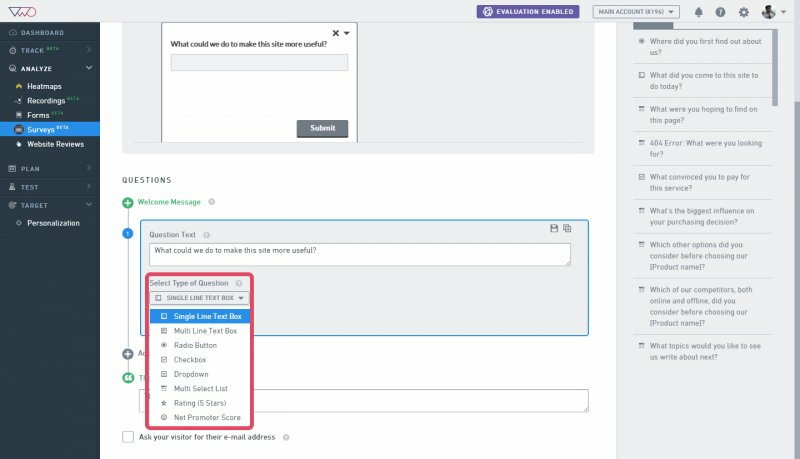 For question types like radio buttons, check boxes, drop-downs, and multi-select lists, you can add “Others” as an option, which opens an additional text box to enter comments. (Optional)Enter the Thank you message for visitors who took part in the survey. The Thank you message always shows up. If you have a customized message, you can add it here to display it for your visitors after the survey. If you have not added a custom “Thank you” message, the default message is displayed for the visitors. (Optional)Select Ask your Visitor for Email if you want to request email addresses of the visitors who took the survey. The question text for this option can be edited. VWO Surveys provides you with a comprehensive question bank. Click a question in the question bank to add that question to the surveys. If a user tends to use a particular question frequently, the user can save it to the question bank for later reuse. The question bank has two sections – General and Custom. General displays pre-defined questions, whereas Custom displays questions added by you.